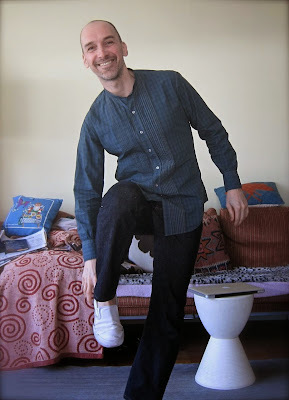 male pattern boldness: Dye Another Day or "Ain't Nothing Like the Teal Thing, Baby"
Dye Another Day or "Ain't Nothing Like the Teal Thing, Baby"
I hit the Procion dye bottle again yesterday, readers. 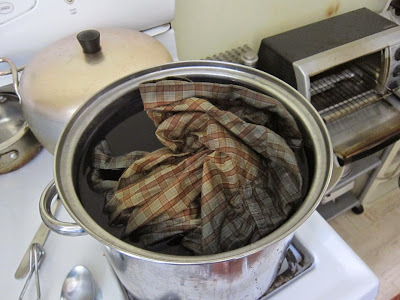 1) I dyed only one shirt (the plaid one), leaving plenty of room to stir my garment. 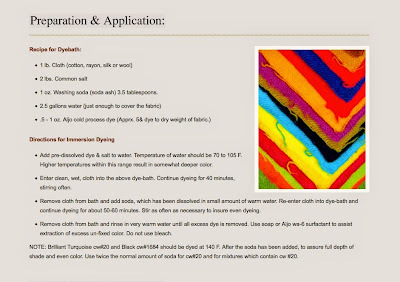 3) I followed new instructions (from the Procion dye website here). 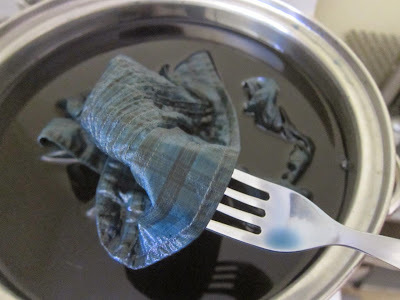 The shirt was in the dye before and after I added the soda ash for nearly an hour each time. 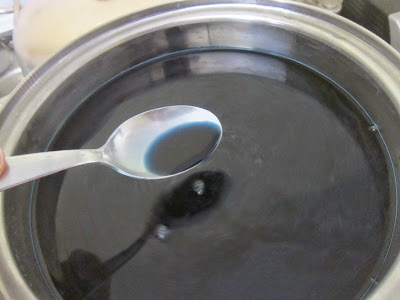 For my dye bath I mixed turquoise and black. After a lot of rinsing in very hot water, I machine laundered my shirt (alone) with mild detergent. After air drying, it looked like this. I love the rich teal color. Now, remember the solid beige shirt I'd dyed streaky maroon and then bleached out with Rit color remover? 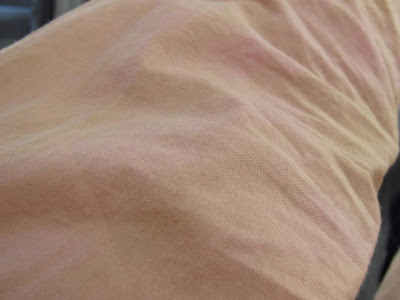 After I machine laundered it, it lost most of its beet color and now looks rose beige with (subtle) pink blotches. I'm afraid that if I dye it darker the blotches will be more pronounced. Should I try it or just leave as is? It's subtle now but might look funky darker. In closing, I feel much more confident about dyeing fabric and very open to doing more of it. Yes, it's time consuming and uses obscene amounts of water, but it is fun. So much better. :) To be perfectly honest, the other shirt can't look much worse, color-wise; I'd give it a go just to see what happens. 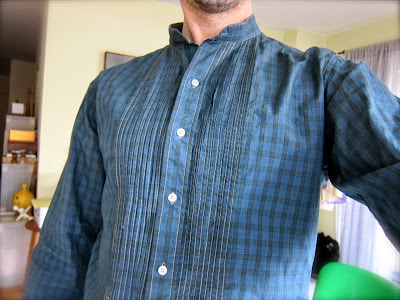 The shirt looks great, and you've caught the dyeing bug! It really is fun, isn't it? I love the redo! I have to say that I like the other shirt as is. I liked the plaid shirt tan, and I like it even better teal. Good job! I love how the teal shirt turned out. Your persistence really paid off. Hooray for successful dye projects!! Your shirt looks wonderful! Standing for hours, stirring a pot full of cloth is not the most exciting thing to do, but it really seems to be necessary for an even color application. I have never been able to tell just what it is going to look like after everything dries, but I suppose that is part of the adventure. Not sure how a blotchy fabric would turn out. You may have to go rather dark to cover it? Or wait long enough, and this will become a trend on the runway . . . perhaps hypercolor will come back? I had the same thought about over-dying a darker color. It might even mask all the blotches. I adore that teal plaid; it looks fabulous on you! The teal looks great. How about this season's "Marsala" for the other one. It's in the same colour family as the shirt is now and I think it would suit you very well. The teal looks great on you. *overdyed, sometimes overdone, but never overdid! and *defs, short for definitely though in the end I saved myself absolutely no time whatsoever - thank you Google! Looking good! I'd forget the 2nd one. Or not, can't get much worse. The light blotches will probably show up in a darker dye...but I'd try anyway. Love dying, but in CA can't use that obscene amount of water guiltlessly. I love the teal. Give the second one a go. PLEASE dye the solid beige/splotchy pink shirt. The plaid is more than improved, or salvaged, it's sharp. I was thinking about your dyeing experiment the other day - Fez on That 70s Show was wearing a shirt that was the same kind of streaky wine color that the beige shirt was and it was bought that way. Rit Color Remover is an amazing product. Dyeing is so much fun but accidents happen and sometimes they aren't happy ones. Keep laundering it separately or with very dark colors because it'll leak dye for many more washes despite colour fixing. 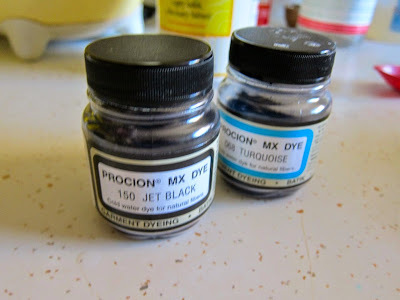 The procion is used for tie dye, so you could do that on the blotchy one. Just kidding. I agree with some of the others, that it can't get much worse, especially if you go medium dark. It would be educational. I'm not a Rit lover, but it does tend to cover colors better that some dyes. The teal is great! I'm glad you tried that. 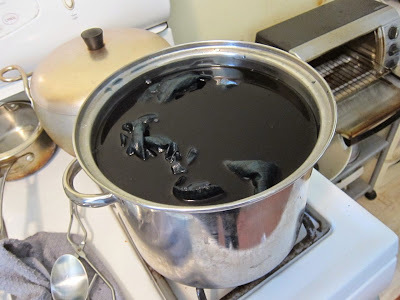 I used to dye clothes in my top loader washer. It was great because I could let it agitate then stop and soak and repeat however many times I wanted. Since that washer went kaput and we have a front loader, I haven't dyed anything. But if I did the thing I would use for the agitation would be something called a MobileWasher. They're sold on Amazon for under thirty dollars. I bought one for work socks that I prewash but your current project inspires me to dye-dye again. The water use and water pollution from rinsing keep me away from too much dyeing. Best to think hard about the cloth colour before a project. Accidents happen though, and not everything makes up satisfactorily. I'd rather rip these garments for re-use elsewhere. Random thought taking off from ooobop! comment - if the blotches will show up as those with more dyeing experience think they will....what about making them blotchier and all over the shirt? I'm thinking take a weak bleach and make abstract designs before dyeing. Or take a really dark dye and make the designs first. Either way, ending up with a subtle tone-on-tone result. Maybe? I love how the teal shirt came out, but I love the title of this post even more.